Asian cuisine has been known to wrap up the most incredibly healthy foods in simple, relishable dishes that pop up on one’s table with hallowed regularity. Such is the case with the not so popular black sesame seeds (Sesamum indicum), a precious spoil of nature, full of vitamins, minerals and antioxidants. According to traditional Chinese medicine, eating black sesame seeds balances physical health as a result of a varied and rich nutritional profile. Black sesame seeds are known to promote good health by delaying the aging process on a physical level, curing ringing ears, improving poor eyesight and preventing premature hair graying. Chinese folklore regards the seeds as a symbol of immortality, which shall be bestowed on whomever eats them. Most of the benefits of the seeds are a direct result of their generous content of vitamins A and E, B vitamins and dietary minerals such as calcium, zinc, magnesium, copper and iron. What are black sesame seeds and what do they look like? Well, black sesame seeds are actually a more nutritious variant of the regular white sesame seeds. Instead of the trademark milky-white color, the seeds are pitch black. They still grow in pods and share the millimetric size of the first, having a teardrop shape with a slightly rounder end and a more pointy one. The black color, although not very appealing, is indicative of strong antioxidant compounds which add to the benefits of the seeds. What do black sesame seeds taste like? Whereas white sesame seeds have a mild, sweet nutty flavor, black sesame seeds boast a slightly stronger nutty taste and feel a bit smoky. However, it is quite hard to make a clear distinction between the two when they both taste nutty and good. Are black sesame seeds healthier than white sesame seeds? Actually, yes. According to the great majority of studies conducted on the matter, black sesame has a higher nutritional profile than white sesame. Also, keep in mind that whereas white sesame is almost always hulled, black sesame seeds can be found unhulled. The hull is an important source of nutrients, in this case calcium. However, sesame generally has an excellent calcium content even when hulled, so imagine how much better the black, unhulled variety is if hulled white sesame provides almost 100% of the RDA of calcium per 100 g of seeds. 1) Antiaging properties. Black sesame seeds are rich in important nutrients such as B vitamins and iron. A B vitamin or iron deficiency can lead to hair graying, hearing loss (also manifested as tinnitus) as well as memory loss, all signs associated with aging. 2) Promote bone health. 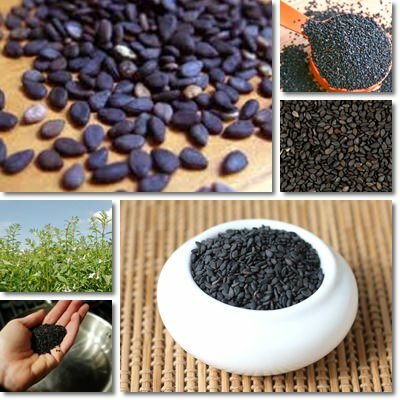 Black sesame seeds are a rich source of calcium, especially whole ones. Calcium is essential for strong healthy bones and an adequate dietary intake can help in the prevention of osteoporosis. You can add them to your morning yogurt, kefir, cereals or let them soak in water overnight to soften a bit. 3) Ensure beautiful skin. Like most seeds, black sesame seeds abound in vitamin E, a fat-soluble nutrient necessary for skin health. Increasing your nuts and seeds intake (we are talking about a moderate intake) can give your skin a natural, healthy glow. 4) Cholesterol-lowering properties. Sesamin and sesamolin are two potent polyphenols with excellent antioxidant properties. Research suggests that not only do they help lower high blood cholesterol levels, but also maintain artery health and increase vitamin E absorption. However, regardless of the variety, all sesame seeds are 60% fat, of which 9% is unhealthy saturated fats and are rich in calories (around 600 kcaal/100 g). If consumed in excess, fats add up to our daily intake and, in time, may significantly increase LDL (bad) cholesterol levels. Sesame seeds are healthy as long as you sprinkle half a handful over your favorite dish now and then. Eating them on a daily basis, especially in high amounts (more than 30-40 g) can have negative effects on cardiovascular health. 5) Liver detoxification and cancer prevention. Sesamin, a powerful natural antioxidant found in black and other varieties of sesame seeds, was shown to cleanse the liver of harmful toxins. A healthy liver is highly efficient at detoxifying the body of toxic compounds which may accumulate over time and cause chronic illnesses such as cancer. 6) Potent natural laxative. Black sesame seeds help relieve constipation in two ways. First due to their high fiber content (over 11 g of dietary fiber/100 g of seeds), and secondly due to their high unsaturated fatty acid content (49.5%). While fiber adds bulk to stools and regulates intestinal motility, promoting easy bowel movements, fats lubricate the intestines, favoring passage. 7) Digestion aid. Being rich in dietary fiber, black sesame seeds support healthy gut flora and favor digestion, contributing immensely to digestive health. Moreover, being a wonderful source of B vitamins, calcium, copper, iron, magnesium, zinc and vitamin A, black sesame nourishes the body and helps prevent nutrient deficiencies. Despite being incredibly healthy, sesame seeds, no matter the variety, may cause allergic reactions. If you have already dealt with nut or seed allergies and have never eaten sesame seeds or sesame seeds byproducts such as tahini, hummus or halva (halawa), then you might want to consider taking a skin prick test (skin allergy test) first. Symptoms of sesame seeds allergy may vary in intensity and range from mild skin redness, itchiness (dermatitis), breathing difficulties, asthma and even anaphylaxis with hypotension (low blood pressure) and swollen airways. Health is our most precious asset and taking care of it, of us should be a priority. If you notice some foods do not agree with you, visit your doctor and find out if it is something of serious medical concern.